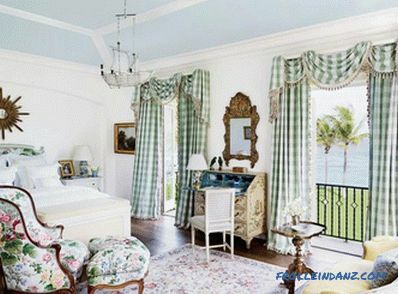 When designing the room, experts pay attention to the fact that curtains in the interior play the final role. They give the image and style of the room a final look. 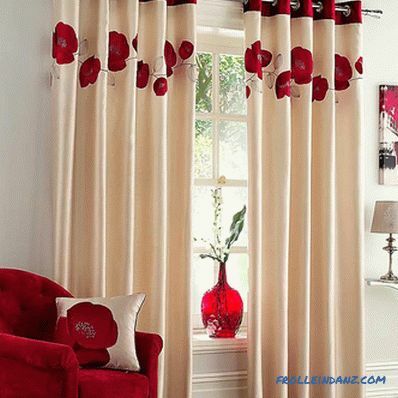 The right curtain is a harmonious accent that adorns the room. 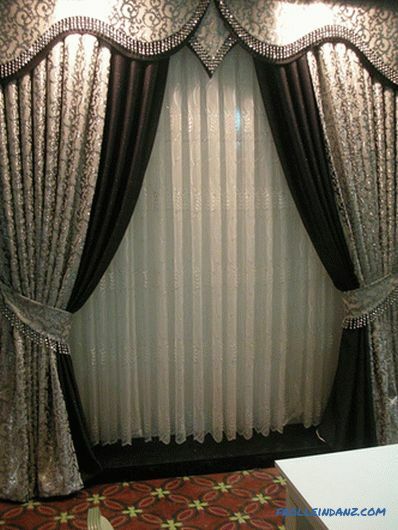 Conversely, an inappropriate curtain is an interior catastrophe that reminds of itself every day. 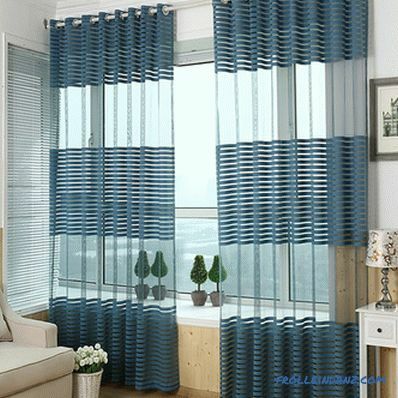 When tailoring curtains to order or buying them, you should pay attention to color, texture, style, material, style and size of products. But about everything in order. What will curtains be combined with (furniture, walls or decor)? Should they be in the same tone with the interior or, on the contrary, will they become a bright accent? Will they have a functional role or decorative? 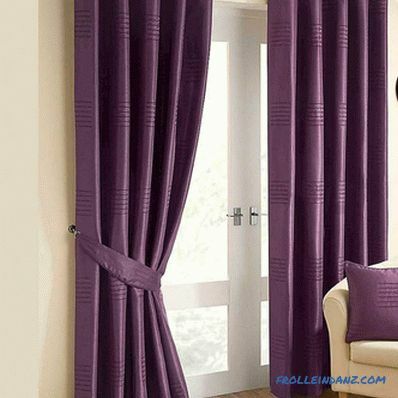 An important factor in the choice of curtains is the stage of creating the interior. 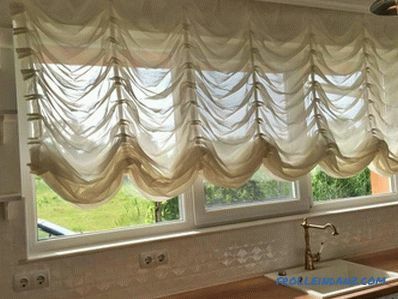 If the repair is already completed (the walls, floor and ceilings are decorated, the decor is set), then the curtains are selected for any of the interior elements. If the repair is only designed, then the choice is guided by any of the proposed methods. Curtains in modern interiors can be either contrasting or neutral. black is a very bright and active color, however, it is rightfully considered neutral, under walking to a diverse color palette. 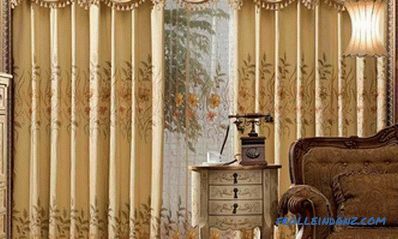 The combination of the color of curtains and wallpaper in the interior is suitable for decorating small rooms, as the walls merge with the window into a single line , the space is not divided into parts. Also, the scheme of selection of curtains for the color of the walls is considered the safest - there is no chance to miss and choose the wrong color. 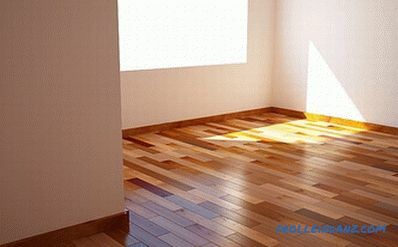 No matter what color the floor, ceiling or furniture. If the walls and curtains are in harmony, then this is a winning option. You can play with shades, and choose light brown draperies under brown wallpapers. They, by the way, can be with drawing, an embroidery, a pattern or an embossing. This option will look elegant. 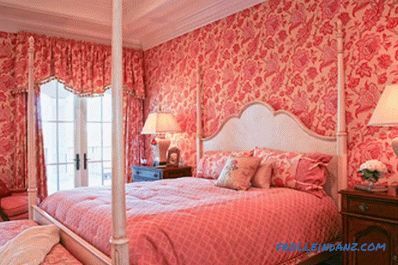 Often the bedrooms or the rest rooms are decorated in the same color, that is, the room is characterized as a "blue room" or "pink bedroom". However, behind such a formulation lies a combination of light and dark edges of the same color, its halftones and subtones. To create the interior of the "blue room", wallpaper and paint are selected in blue, curtains and textiles are chosen in the desired blue shade, but with a pattern. Such a move adds liveliness to the setting. 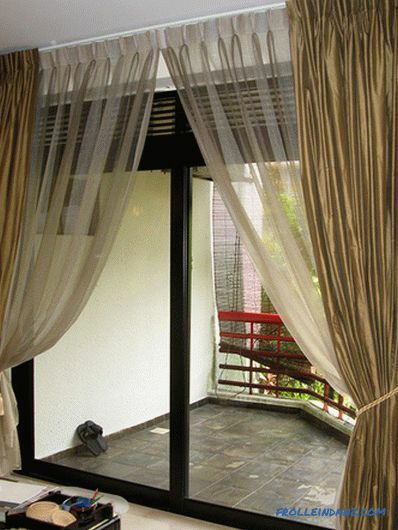 Curtains fit harmoniously into the space, not standing out from the general background. Colored curtains in the interior are a bold accent that can completely change the monotonous, rigorous design, filling it with juicy energy. For neutral interiors, made in white, beige, gray or black, choose the curtains of rich color from the spectrum of the rainbow. For example, the white interior is enlivened by deep green shades, and bright orange panels make it warmer. 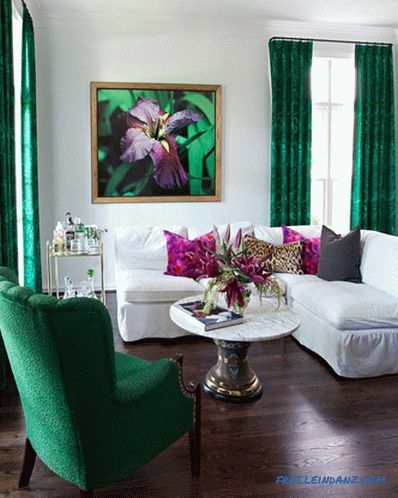 Tip: if bright curtains seem too bold decision, then choose one of the neutral colors on the principle of contrast with the rest of the color gamut the premises. 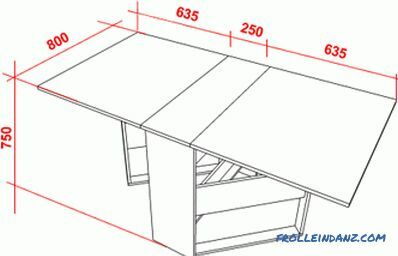 This scheme is suitable for the final part of the work on the design of the room, and for the initial part. If the whole interior is already decorated, then several basic colors and patterns of the room are chosen for the window's textile design. 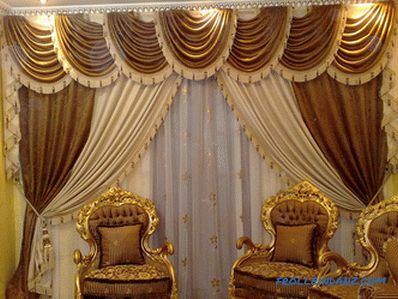 For example, curtains of a direct cut of gray and golden color will be suitable for a modern interior. When the interior is just planned, the curtains pick up the rest of the textiles, and then adjust the rest of the room's colors to match it. 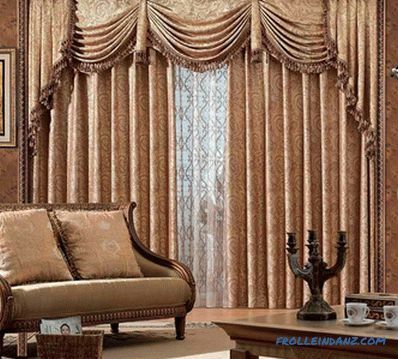 For example, beige and maroon curtains will complement the carpet of the same color. 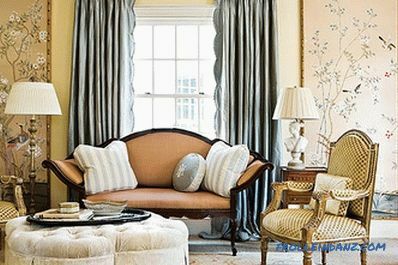 When determining how to choose curtains for an interior, pay attention to the variety of their shapes. Such products consist of several layers of fabric (most often two). One of the layers can be with a pattern, the rest are selected monophonic. 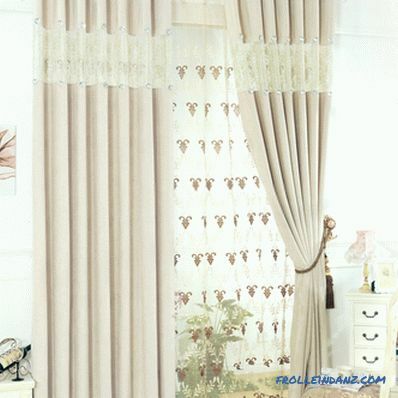 Multi-layer curtains look rich, they are often selected for the living room or bedroom. Lambrequins are widely used not only in the design of public buildings, but also in private interiors. Due to the different cut, the pelmets have a different size and shape of the cut.They are characterized by the use of several types of fabric, a combination of several colors, the presence of decorative ornaments in the form of eyelets, pendants, grabs, and fringe. Rolled are suitable for the design of a modern interior in the style of minimalism or high-tech. They do not take up much space, perform a protective and decorative function of the simultaneous. 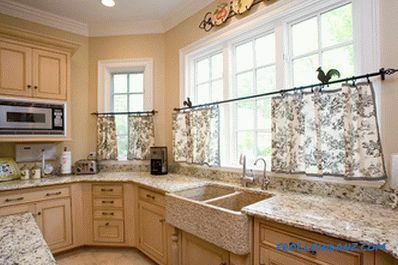 Curtains, curtains, cafes and other short curtains are most often selected for the kitchen or small rooms in which they look appropriate. 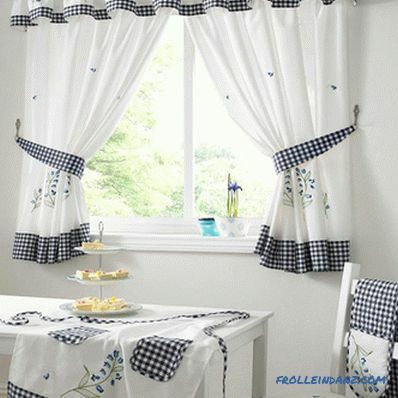 Ordinary curtains close the upper part of the window, curtains-cafe - the lower part. The variety of fabrics is very large: they are light and heavy, natural, synthetic and mixed , absorbing and reflecting light, anti-dust and fire resistant. 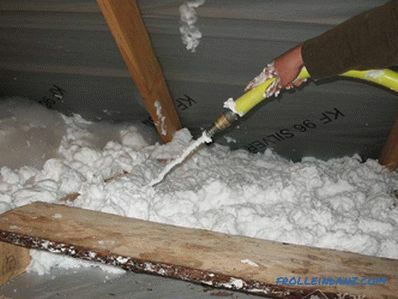 Depending on special requirements, the fabric is covered with a protective layer from dust or moisture. natural linen, satin or cotton is an environmentally friendly material that is suitable for a nursery or bedroom. 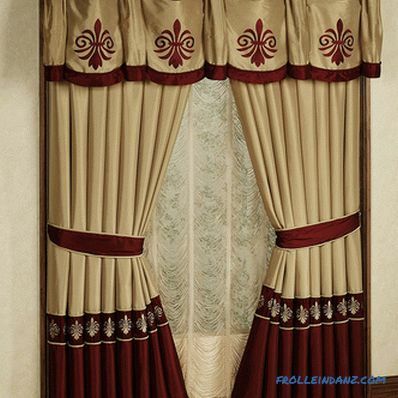 For classic and neoclassical interiors, curtains are made of thick curtain fabric, complemented by decorations in the form of pickups, fringe, and suspensions. 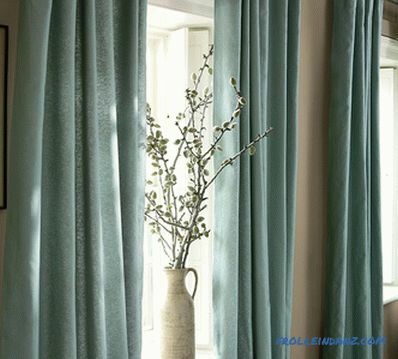 Often, classic-style curtains are made in the form of a lambrequin, combining the fabric of several colors. 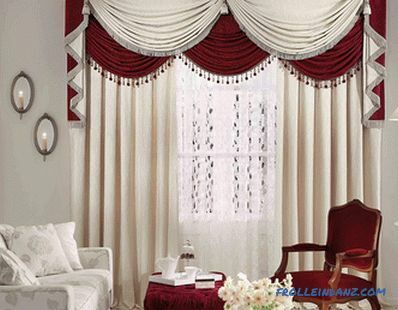 Curtains made of small straight pieces of fabric with a special control mechanism are called Roman. Roman are different from the roll control method. They are a transparent one-colored curtain of light fabric, assembled in horizontal folds on all surfaces using rings on the other side. 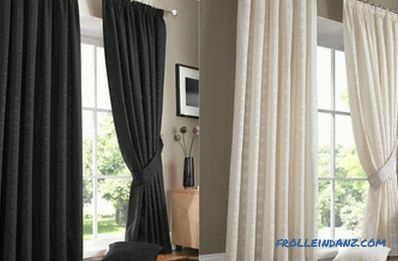 Curtains are collected in more lush folds with the help of a lifting mechanism and sewn festoons. 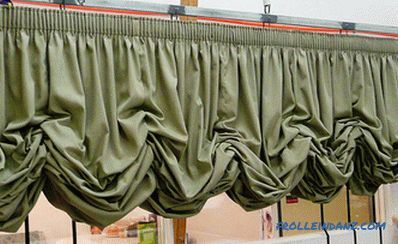 Classic Japanese curtains look like rectangular frames covered with thick fabric. They move with the help of upper and lower rails. Modern Japanese curtains have a lightweight design. They are a rectangular thick piece of cloth with a weighting agent below. 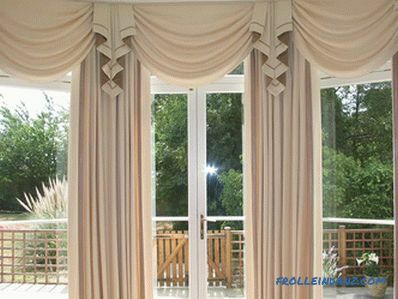 This style is very similar to French curtains, but unlike the latter, they are gathered into folds at the bottom . On the loops: the curtains usually have a simple rectangular cut, and are mounted on the baguette with the help of loops (sewn or on Velcro). On the drawstring: a versatile option for any cut, type of fabric and color. On the rings: suitable for any curtains of lightweight material. 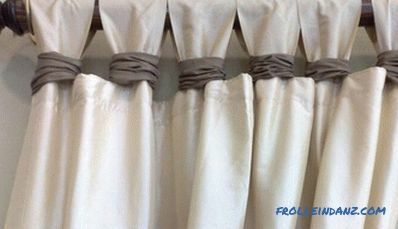 For grommets: Great for light and heavy curtains. 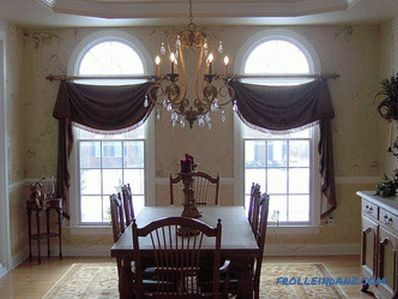 A small room can be visually enlarged using a baguette or cornice longer than a window. 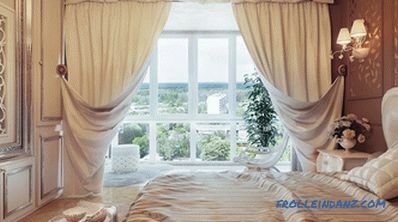 If the curtains will occupy completely one wall, then they will create the effect of a large room. 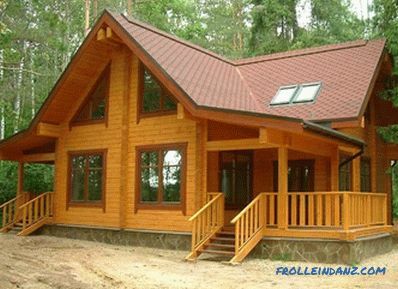 The low window is easily adjusted using the eaves. To do this, it is placed directly under the ceiling. To open up part of the wall above the low window, use the pelmet. 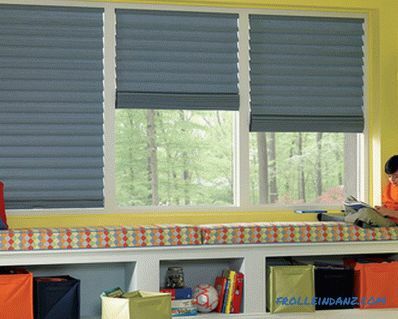 To visually reduce the area of ​​the window, use bright colors and curtains to fit the window. 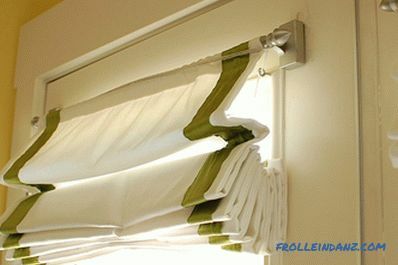 These can be blinds, roman, roller blinds or short curtains. 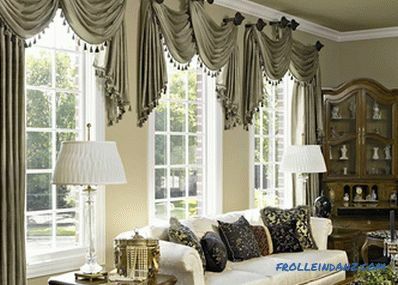 It is good for this option suitable for roller or Japanese curtains that divide the window into several segments. Also, a large window can be visually divided into two using asymmetric curtains, the long ends of which will be in the middle. 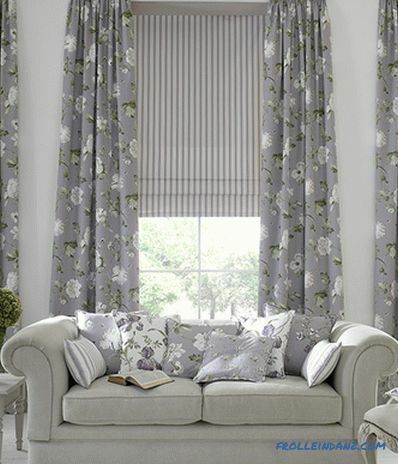 When selecting curtains for a room, you must take into account its functional load, age and number of inhabitants. 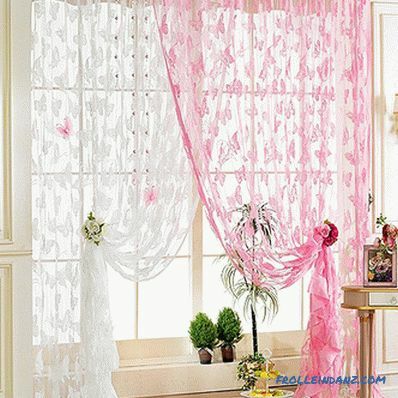 blinds can be selected for a girl in combination with cotton curtains. Curtains to protect children from bright light are picked up to the nursery. Most often it is a combination of a light transparent veil with thick curtains. 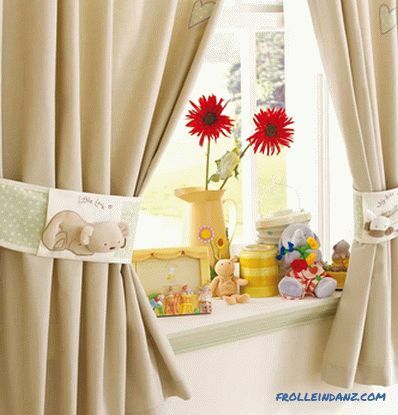 Also, the curtains can be with a pattern of characters of favorite cartoons (option for the youngest). 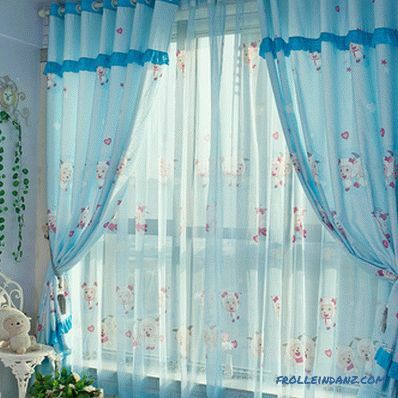 Too bright colors for curtains in the nursery are not recommended to be used, as they will irritate the nervous system of the child, not allowing you to fall asleep or just calm down. 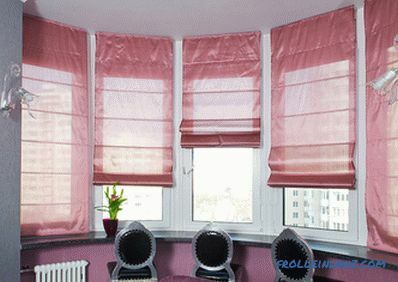 Functional short curtains with an antistatic or dust-repellent coating are chosen in this room. 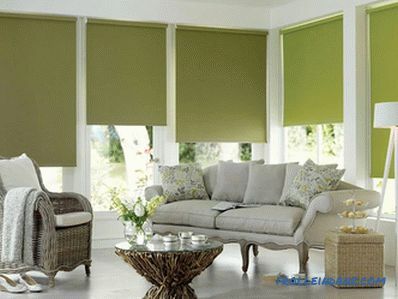 Curtain cafes, blinds, Roman or roller blinds are best. If you rarely cook in the kitchen, just make tea or warm up food, then a lush marquise or a small pelmet may also be a good option. 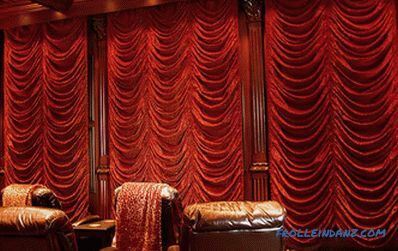 In the interior, the curtains for the room are carefully selected taking into account the color palette and the general style of the room. 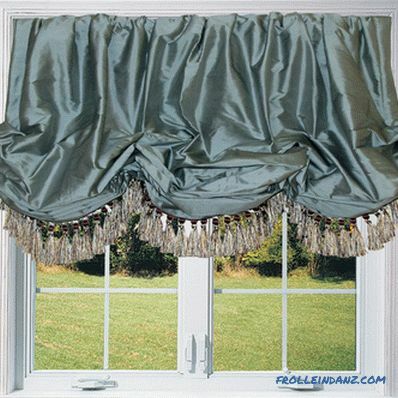 Most commonly used are French Marquise, Austrian, classic or multi-layered curtains.